And here is what I came up with. I couldn't work a sentiment onto the front of the card, but that's OK. I have the full inside! Card base is Taken with Teal (one of the colors that is going away). 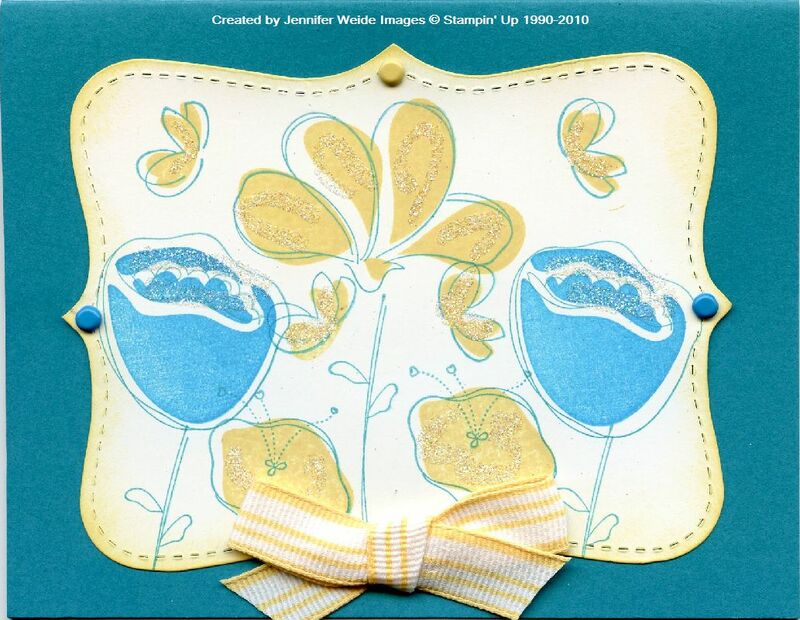 I cut the Top Note from Whisper White and stamped the flowers and butterflies in So Saffron & Tempting Turquoise with Taken with Teal outlines and stems. The edge of the Top Note was sponged with So Saffron. A So Saffron brad was added at the top point, and Tempting Turquoise brads on the side points. The So Saffron striped ribbon was tied into a bow and attached at the bottom point. Lastly, I used my Two-Way glue pen and added Dazzling Diamonds glitter to the flowers and butterflies (click the picture to enlarge to see detail). Order your set NOW, or book a workshop and earn it free with a $350 workshop total. The set is available in clear or wood mount this month only until the new catalog comes out. Happy Monday all! Off and running to see how much I can cross off the to do list today!! Beautiful card...I love that top note die too...thanks for sharing. Very pretty! I love the placement of the brads, very clever! Thanks for playing along with us at Stampin' Royalty! What a fabulous design - really pretty! Thanks for playing with us at Stampin' Royalty! Wow - I love this card. I can't wait to get that stamp set. Thanks for playing with us at Stampin' Royalty.